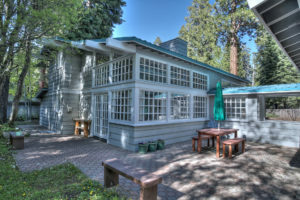 Home > Price Reduction in Tahoe City! Price Reduction in Tahoe City! Price reduced on fantastic home in an unbeatable Tahoe City location! Moments away from town, but on a very quiet street with a real feeling of seclusion, this light and airy home on a perfectly level lot has no steps to the front door and accessible, main level master–a very rare find in Tahoe. Charming architecture with 2-story original mullioned windows make this a truly unique mountain retreat. Come take a look! Garage is heated and plumbing & stairs installed, ready for potential added 900 square feet of living space in the sunny space above. Nearby Tahoe City offers shopping, dining, concerts, and sales & rentals of every piece of outdoor equipment imaginable; boats, mountain bikes, cruisers, kayaks, paddle boards, skis, snowboards–get your gear and head to the lake or the hills! Squaw Valley, Alpine Meadows and Homewood ski resorts all within 20 minutes.